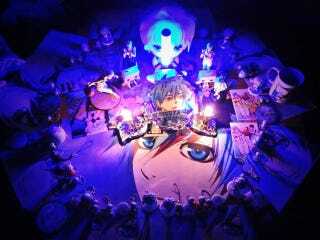 To mark Tetsuya Kuroko's birthday, fans created a Twitter hashtag to upload images of the character, fan art, and notes—which is neat. And since it's long been a thing in Japan for a select few (I cannot emphasis the word "few" enough) fans to have birthday cakes for anime characters, there are the inevitable cakes, too. If you want to have a birthday party for your favorite character, fine. Do it. Have a blast. And yes, I get it, Tetsuya's hair is blue, but please, for the love of all things good, knock off the blue light. Makes these look like some kind of manga sorcery.